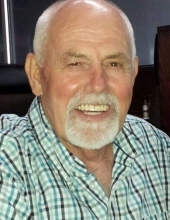 MOSES, Ronald Leslie - Age 70, of Fenton, passed away Tuesday, January 15, 2019. Funeral Services will be held at 2 PM Friday, January 18 at Sharp Funeral Homes, Fenton Chapel, 1000 Silver Lake Rd., Fenton. Deacon Patrick McDonald officiating. Visitation will be 4-8 PM Thursday; and 1-2 PM Friday. Those desiring may make contributions to Arbor Hospice or Cerebral Palsy. Ronald was born February 9, 1948 in Flint, the son of Alvin and Gloria (Kelley) Moses. He was a graduate of Waterford Kettering High School. Ronald served in the U.S. Army from 1966-1968. He was a Land Surveyor and retired from JCK Associates Inc. of Novi. He married Lisa Lee on April 24, 1992 in Livonia. Ronald lived in Fenton since 2000 coming from Waterford. He was an avid hunter and a member of the NRA and Commemorative Bucks of Michigan. Ronald was a woodworker and handyman who could fix anything. Surviving are; his wife, Lisa; 2 children, Ronald "Little Ron" (Angela) Moses of Waterford, Michael Moses of Waterford; 2 grandchildren, Hayden and Riley; siblings, Russell Moses of Florida, Merrie (Jim) Johnson of Davisburg, Ann Morabito of Nevada; and several nieces and nephews. To send flowers or a remembrance gift to the family of Ronald Leslie Moses, please visit our Tribute Store. "Email Address" would like to share the life celebration of Ronald Leslie Moses. Click on the "link" to go to share a favorite memory or leave a condolence message for the family.